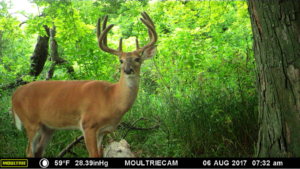 Summer is a great time of year to take an inventory of bucks on your property. 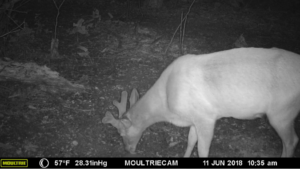 Although, not every buck you get on camera now will be on the property in the fall due to bachelor groups breaking up, it’s still nice to get an idea of what is in the neighborhood. 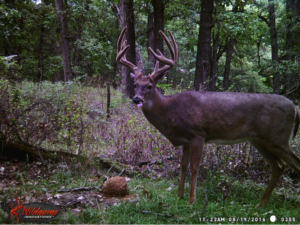 Here are 5 great options for attracting bucks to your trail camera this summer. The Ultimate Mineral Site: This involves putting down a bag of Mineral Dirt 180, then putting an Ani-Mineral Block on top of it. Lastly, pour a jug of Liquid Mineral Dirt 180 over the whole site. This has the best of all things in the mineral category. It has longevity with the block, it provides great intake with the granular and liquid minerals. Here is a video I made last year with Sportsman’s Guide on how to establish the ultimate mineral site. The Ani-Protein Block: This block has all the things that deer crave, but all the ingredients are stuck in block form, so it lasts a lot longer than if you poured out a 20 lb bag of Ani-Supplement GOLD. One block will usually last about a month, so for around $20, you can be bringing deer in over a long timeframe. Ani-Supplement GOLD: Most of the time when I pour out a bag of Ani-Supplement GOLD, I have deer on camera within 4 hours. 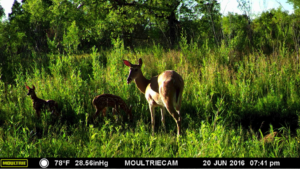 I also get pictures of every deer using that area, so it’s a great way to see what bucks are using the property as well as determine how many fawns were born this year. The only downside is that it’s hard to keep up with how fast the deer eat it. To help keep the feed from spoiling, we suggest putting in a feeder off the ground. If you don’t have access to a feeder, try to plan putting out the feed when it will not rain for a couple days. Granular Braggin Rights: If you have a place you want to attract deer that is well off the beaten path, Braggin Rights is your best option. It’s an easy to carry 6lb bag and the attraction power is better than a 50lb bag of corn. It’s a great way to get a quick inventory without breaking the bank. When I pour out a bag of Braggin Rights, it’s usually completely eaten by deer in 3 days. It will still attract deer for another 5 days after it’s gone because deer keep coming back to see if the area has been replenished. Liquid Braggin Rights: If you are looking for a way to attract deer that won’t attract the attention of your neighbors, consider using the Liquid Braggin Rights. You can pour this out on a decomposing stump or log and it simply helps those decompose faster because the deer are going to tear it up, but it won’t leave a giant crater in the ground like what happens at the mineral sites. These are all great options to not only get bucks to pose for trail cam pics, but you are also giving their health a boost. Deer in the wild do not have access to all the minerals they need to be healthy, so anytime you can provide them with what they are missing, health and wellness will be improved. Feel free to make combinations of the above list. I like to put the Ani-Protein Block 365 out and top it with liquid Braggin Rights. I also like to pour a bag of granular Braggin Rights on top of the Ani-Mineral Block. With all of Ani-Logics products providing attraction power, the successful combinations you can do are endless!